It was two years when I fell in love at my high school reunion. 25 year reunion, no doubt. I fell in love with a watermelon and feta salad with mint. It was amazing and I still enjoy making it on occasion. There are other versions that call for jalapeno to add a little kick or basil in lieu of the mint and I think these are also nice ideas. But when SavorSA.com posted a recipe for Insalata de Pomodori e Melone, it took my breath away. Really. All of the ingredients are currently available at the Quarry Farmers & Ranchers Market making this salad even more fashionable. The recipe comes from David Rocco’s new cookbook “Made in Italy,” and I suspect that after John Griffin’s (he is co-founder of SavorSA) recent Italian adventure, this is a way to recapture those spectacular tastes that seem so close but yet so far away. If you have never combined these two fruits–melon and tomatoes–you’re missing out on an amazing flavor combination and texture. This year’s crop of watermelons and cantaloupes have been great and the tomatoes are peaking right now with lots of choices such as heirloom, beefy tomatoes, assorted cherry and pear tomatoes and zebra tomatoes. Tossed with a crisp and crunchy cucumber, a little red onion, oil and vinegar, a touch of fresh basil and generously spooned over lettuce, I’m all set for a summer sensation. And now so are you. This salad is fabulous and says summer like no other. The sweetness of the melon, ripe tomatoes, crisp cucumbers and red onion playing with flavor-packing herbs, a splash sherry vinegar and several glugs of good olive oil bring this summer salad together. Feel free to exchange cantaloupe for watermelon or vice versa and use whatever tomatoes look best--heirloom, zebra, cherry or pear. Red wine vinegar for sherry vinegar. Oregano instead of basil. Arugula for butter lettuce cups. Mix it up. The key to the salad is to mix the chopped tomatoes, cucumber, cantaloupe, red onion with the sherry vinegar, olive oil, herbs and spices and let sit for 5 minutes so the flavors meld. Be careful not to overdo it with the basil or red wine vinegar. 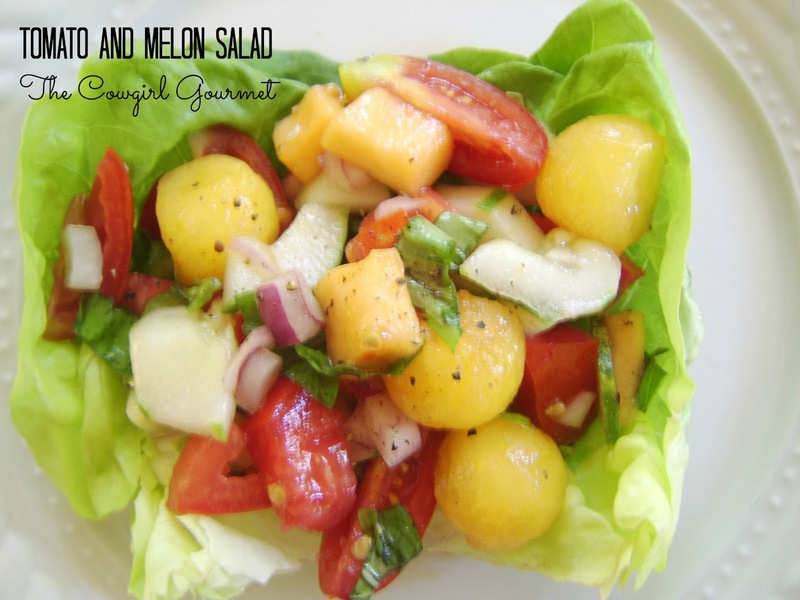 These are really just small complements to the tomatoes and melon. On a serving plate, sparingly lay out the peppery arugula or place a piece of Butter lettuce to serve as a "cup". Add the seasoned fruits and vegetables on top, drizzle with a little more olive oil, a grind of fresh black pepper and serve immediately.